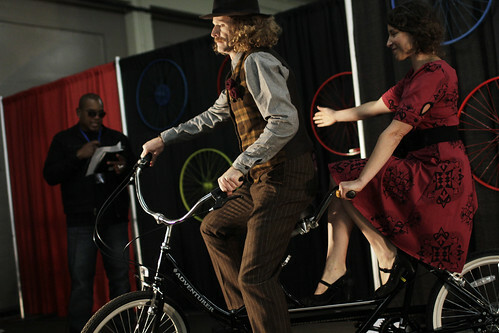 Nathan and Kristen are so fabulous on this folding tandem that I'm gonna give them a whole tour around the runway. 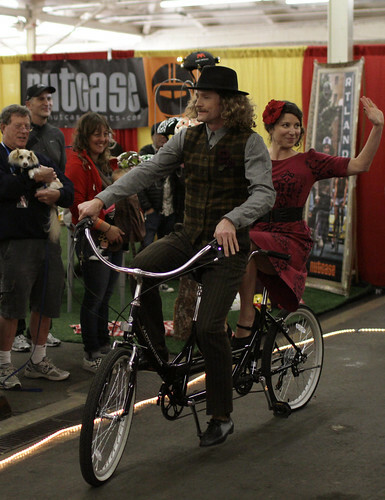 And that ends our trip down the catwalk with Pedal Savvy this year. Congrats to Gwen and her team for putting together such a creative and energetic show! Hope these photos and links gave you inspiration to spice up your wardrobe on and off the saddle (preferably on)! Happy Holidays to everyone and catch you before the new year! Thanks for mentioning our Gobha caps. We're right in the middle of a 200-cap run of water-repellant, Merino wool reversible all weather hats, with a bunch of new colors; one of the new color-ways is SF Giants orange-and-black. 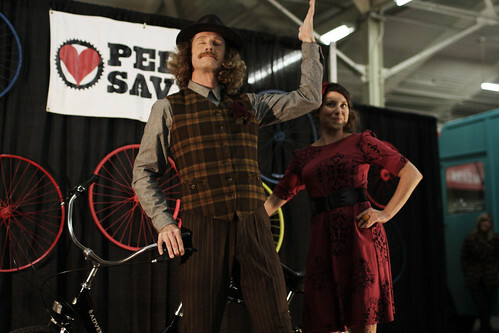 So all you baseball-fan cyclists,with a wont for getting caught in inclement weather, check out Gobha-Clothing.com in mid-January. If you're a cyclist with all-weather tendencies, who's fine with the Giants but not into wearing their colors, check us out now notwithstanding, as we've got lots of beautiful colors in Levana Merino wool jersey fabric that we imported directly from New Zealand.